Those awaiting results of August 2016 Veterinarian board exam can find here the full list of passers, top 10 (topnotchers), top performing school and performance of schools as the Professional Regulation Commission (PRC) and the Board of Veterinary Medicine released results in 1 working day after the exam. 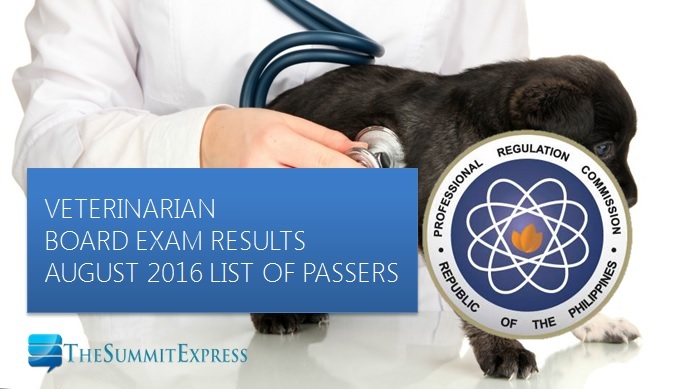 PRC on Friday announced that 327 out of 762 passed the Veterinarian Licensure Examination. PRC administered the Veterinarian board exam on August 23, 24 and 25 in the cities of Manila, Baguio and Cagayan de Oro. From September 1 to September 2, 2016, registration for the issuance of Professional Identification Card (ID) and Certificate of Registration will be done on-line. Please go to www.prc.gov.ph and follow instructions for initial registration. Those who will register are required to bring the following: duly accomplished Oath Form or Panunumpa ng Propesyonal, 2 pieces passport size picture (colored with white background and complete name tag) and 2 sets of documentary stamps. Successful examinees should personally register and sign in the Roster of Registered Professionals. The three-day exam covered the following subjects: veterinary anatomy, physiology and parasitology (Day 1), veterinary pathology and pharmacology and zoothenics (Day 2) and veterinary microbiology and public health and veterinary medicine and surgery (Day 3). According to PRC, the target release date of results of the recent Veterinarian board exam is on August 30 or in 3 working days after the exam. In September 2015 exam, results were announced online in just 1 working day. A total of 299 out of 719 passed the Veterinarian Licensure Examination. University of the Philippines Los Baños (UPLB) topped the board with 94.23 passing rate. We advise examinees to monitor release of results starting Friday, August 26 or in 1 working day. Like Us on Facebook, follow us on Twitter and subscribe to our e-mail list to receive PRC exam-related news.